“Superyachts in search of an exotic tropical destination and new dive experiences are discovering Koh Samui and the Gulf of Siam, home to Angthong Marine Park Archipelago and other nearby stunning islands”, reports Captain Charlie Dwyer, heading up Asia Pacific Superyachts in Koh Samui, Thailand. The second largest island in Thailand, Koh Samui is becoming world renowned not only for its natural beauty, but also for a growing ‘culinary extraordinaire’ reputation, 5-star resorts and spectacular villas, luxurious spas and a world-ranked golf course. There’s an amazing range of leisure activities to select from on Samui’s verdant, coconut-covered island prior to and between dive visits – elephant trekking, temples, waterfalls, mountain safari, cultural entertainment and attractions, small village and farm life, sea gypsy village, miles of white sand beaches and water sports. Koh Samui is a perfect cast off point for an extraordinary dive journey around the archipelago and surrounding islands. While enjoying the charms of the island a customised ‘Gulf Dive Destination’ Itinerary can be prepared by Captain Charlie and his dive professionals to provide diving and snorkeling experiences for all ages to the best and most picturesque dive spots on surrounding islands. The agent will arrange for a dive team to arrive at the Superyacht anchorage to assist in determining the final Itinerary designed by the agent with the Captain and/ or Owner, taking into consideration the specific needs and preferences of the group, and evaluating dive levels of the group. The marine team professionals will check the level of experience of those aboard, how many dives done and certification level of each diver. With this information and upon evaluating the dynamics between divers and guests, a lead instructor will be assigned - one with massive experience who appears well suited for the particular group. A PADI course aboard the Superyacht may also be arranged with the agent. The team of highly-qualified local staff and long-term resident expat professional dive guides will explain dive locations in detail and handle all preparation, materials and equipment for the dives. “Transport to dive sites can be in the comfort and luxury of a 35’ custom built dive speedboat or the team can meet the Superyacht and guests at the dive locale”, adds Captain Charlie. The three major dive destinations in the Gulf of Thailand are Koh Tao, Sail Rock and the Angthong National Marine Park Archipelago. Also recommended are visits on Koh Samui and close neighbor, Koh Phangan to enjoy warm Thai hospitality, fantastic food, island attractions and white sandy beaches. The following brief description of dive spots, all easily reached from Samui by the owner’s vessel or by private speedboat, will be helpful to those interested in learning more about a dive journey in the Gulf of Siam. Of all the dive locations Koh Tao generally offers the best visibility and optimum dive conditions, whether diving or snorkeling. Koh Tao has a diverse and versatile range of dive sites to suit the experience level of all divers. From the shallow and picturesque bays such as Mango Bay, Aow Leuk and Hin Wong – which are perfect for students and those divers looking for relaxed and gentle diving (great for snorkelers as well) - to the intermediate dive sites such as Green Rock, White Rock and Shark Island - and on to Chumpon Pinnacle (best suited to the more experienced divers). The North of the site gives shallower coral gardens to around 12m, whilst further south you reach deeper waters of around 25m and find beautiful boulder formations. Blue Ringed Angel Fish, Butterfly Fish and Parrot Fish are seen in abundance, and if you’re lucky you may see juvenile Black Tip Reef Sharks and the occasional Leopard Shark resting on the sand. The main pinnacle at this site lies 5m below the surface and the outer pinnacles surrounding the main rock is approx 30m. Giant Groupers, Chevron Barracuda and Jacks dominate the site and it is also a favourite with the Whale Sharks and carpeted in the shallows with hosts of Anemones. This is one of the best sites for students and those divers who haven’t been in the water for a while. The dive begins from the gentle sloping beach and follows the line of the rock along to a maximum depth of 14m. The resident shoal of Yellow Fusiliers is accompanied by Yellowtail Barracuda, Giant Clams and rainbow coloured Christmas Tree Worms. A great place to start a diving adventure! Aow Leuk is a perfect site for students and those wanting a gentle introduction. You can follow the Western wall out of the bay and find schools of Yellowtail Barracuda, paired Weavers Butterfly Fish and numerous Christmas Tree Worms. Glide up into the shallows on your return to the beach and you may be lucky enough to see the resident turtle and where you will also find many Blue Spotted Rays. Sail rock is considered to be the 5 star dive site in the Gulf, lying mid water between Koh Phangan and Koh Tao. It is a granite pinnacle that rises from the sea floor at 30m to stand an impressive 15m above the surface. If offers the diver stunning underwater topography in which to explore sheer vertical walls, beautiful coral gardens and a unique vertical swim through. Sail Rock is home to an extraordinarily abundant variety of marine life in all shapes and sizes. Of special interest and just 20 NM from Samui is Angthong National Marine Park with its spectacular group of 42 uniquely different islands. The setting for Alex Garland's book and then movie, The Beach, it covers some 250 square kilometers, with islands of towering verdant rock masses encircled by clear seas. Upon arrival is Mae Koh beach where you can hike up to an emerald saltwater lake. Angthong has limestone islands and karst topography rising from the sea as dramatic rock cliffs and bizarre rock formations. Kayaking through caves, exploring hidden lagoons and snorkelling among the shallow coral gardens can be experienced in this part of the protected area famed for its natural beauty. All the islands are uninhabited and undeveloped except for Koh Wua Talap and Koh Paluay – which is inhabited by sea gypsies still earning their living by fishing. The site provides wonderful shallow caves and swim throughs. Although visibility here is usually less than at Koh Tao and Sail Rock, when diving you’ll be rewarded with Banded Seas Snakes, Squid, Cuttlefish and huge Barrel Sponges. Coral fringes the shore line in this picturesque bay carpeting the rocks from just below the surface to the sandy floor which starts at 5m and reaches 20m further out in the bay. Heading around the western corner of the bay is a series of lovely overhangs and swim throughs. Juvenile Harlequin Sweetlips can be found if you look carefully along with Blue Spotted Sting Rays and Banded Sea Snakes. A mere 7 NM from Samui is the tropical Island of Koh Phangan, famous (if not infamous) for its ‘Full Moon Party’ held once a month. For those wanting a more relaxing vista of the island there’s stunning scenery to take in while visiting some of the Gulf’s most beautiful beaches. 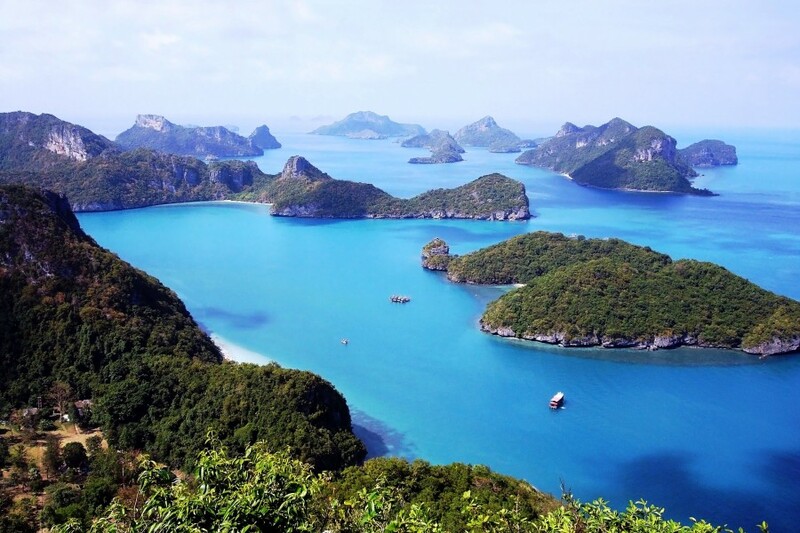 The west coast of Phangan is where you can enjoy the stunning beaches of Had Yao, Ao Chao Phao and Had Salad and also snorkel and relax around the small island of Koh Ma, connected to the main island by a sand bar. A cruise along the east coast will take in the waterfall at Thansadet - frequently visited by King Rama V in the late 1800’s. Moving further northwards is the idyllic bay of Tong Nai Pan which is split in two by an impressive rock formation and ideal to relax by a shallow bay, a perfect swimming area for children. Koh Samui was discovered a few hundred years ago as a spot for sea traders and fishermen passing through the Gulf of Siam seeking refuge from storms. We may not see Koh Samui as the hidden paradise it was four decades ago when privy only to a few travelers in on the secret; however, the island is evolving gracefully, protecting her natural beauty and preserving the heritage of her Thai, Chinese and Malay founders. Using Samui as a base and cast-off point Superyacht guests will discover the beautiful islands located in the turquoise Gulf seas from an Itinerary customised to their personal needs and wishes while avoiding crowds in safety and comfort. The Itinerary will satisfy all guests and divers - whether experienced, intermediate or absolute beginners; providing memorable experiences for all. For those who love Superyacht cruising in a gorgeous tropical environment coupled with incredible new diving experiences, an unforgettable adventure journey awaits on Koh Samui and the Gulf of Siam.